Full-page print advertisement for the City of Carmel. With all the art and entertainment Carmel has to offer, we needed to convey a sampling of the opportunities in a full-page ad. It needed to have an artistic vibe and a headline that captured the spirit of the city. The colorful, complimentary blue and orange brush strokes provided a painterly backdrop for the “City of the Arts” theme. 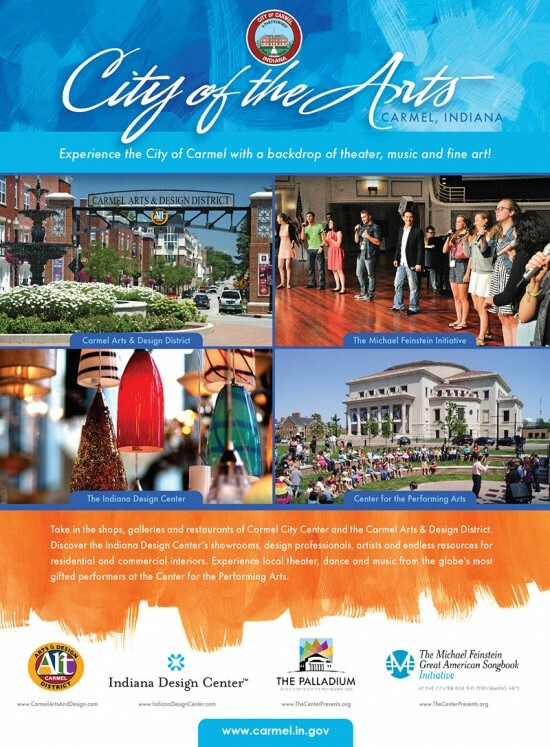 The City of Carmel is home to the Carmel Arts & Design District, the Center for the Performing Arts (featuring the Palladium and Michael Feinstein Foundation) and the Indiana Design Center.